Kerman is the capital of Kerman Province, Iran. Kerman is well connected to most parts of the country by bus. Kerman’s new Bus terminus named Adineh opened in 2013. Freeways connect the city to Tehran, Yazd(360 Km), Zahedan, Bandare Abbas(600 km), Birjand and Shiraz(600 km), Mashhad (920) km. Kerman is connected to the whole railway network of Iran. It is connected to Tehran, Qom, Kashan, Yazd, Mashhad and also to Zahedan in the near future(Under construction). 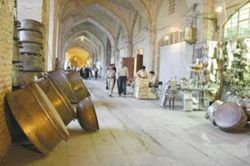 Bazaar - Explore the arcades of this ancient, authentic bazaar, indulge in the smells of oriental spices. 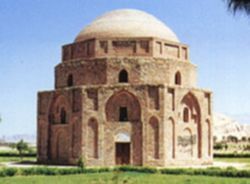 Gonbad-e-Jabaliyeh - An amazing dome in the east of Kerman. Mysterious place, perhaps an ancient Zoroastrian fire temple. Mouyedi Ice-House - There are several small-gardens around this ice-house which were filled with the water in winter, then after the water turned to ice, it was kept in the "ice storage" between layers of straw to use in summer. Amazing centuries-old system. San'ati museum - An interesting museum in contemporary arts of Kerman featuring local as well as famous international artists (Rodin, Dali...). 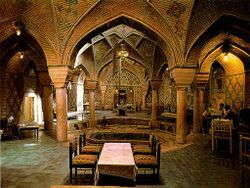 Vakil traditional tea house - An attractive old hammam turned into a beautiful traditional tea house in the covered bazar. Often has live music. Ganjali Khan Mosque - It is located in the north-west of square and near Ganjalikhan School. It was constructed in 1007 A.H. Lovely little mosque, highly recommended! Jameh mosque - The beautiful blue-tiled Friday mosque. Moshtari-ye-Moshtak Ali Shah - A beautiful holy shrine at the end of the bazaar. Blue domes and a peaceful garden. Takht-e-Darya-Gholi-Beyg - A small monument in the side of the hills in the east of Kerman. 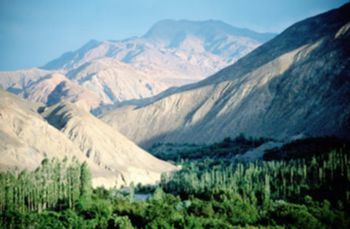 Ghal'e Dokhtar - A historical castle and oldest building in Kerman, on the hills in the east of Kerman; attributed to the Ashkanian era. Nice view on the city to enjoy sunset. 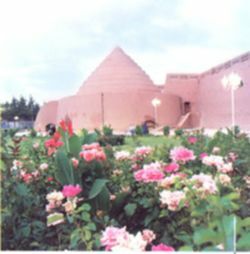 Ghal'e Ardeshir - A historical castle and oldest building in Kerman, on the hills in the east of Kerman; attributed to the Ashkanian era. Zoroastrian fire temple - The sill alive fire temple of Kerman. Big peaceful garden, little museum. Go on an organised Visit Kerman tour As there are so many attractions and landmarks in Kerman, visitors with limited time could take advantage of an organised tour. Have a local guide show the main sights in one or half a day or full day . The wealth of history in Kerman is staggering and Visit Kerman Tour leaders is expert on all Kerman has to show. Visit Kerman Tours offer a comprehensive day tour of the main sights in Kerman. You can almost find any food that is served in other cites of iran.There are many resturants ( both fast food and traditonal) around the city and notably on Jomhuri Blv. The traditional hotel - restaurant Key Khosrow close to the fire temple offers local and vegetarian traditional food in a nice yard. Distills - Kerman have many kinds of aromatic distill's. Black tea (chāi, چای) is the national drink of alcohol-free Iran. It is served strong and with crystallised or cubed sugar (ghand, قند) which is held artfully between the teeth while tea is sipped through. Fruit juices (āb miveh, آب ميوه), A wide variety of fruit juices (āb miveh, آب ميوه) and drinks are available from shops and street vendors including cherry cordial (sharbat ālbāloo, شربت آلبالو) and banana milkshakes (shir moz شير موز). Visit Rayen with a magnificant old citadel (similar to Bam). Mahan is only 30 kilometers away. Thereby you can visit Shazdeh's garden, a UNESCO World Heritage Site which is about 5.5 hectares with a rectangular plot and a wall around it. The garden is a fine example of Persian gardens that take advantage of suitable natural climate. As well as the Shah-Ne'matollah-e-Vali monument. Visit The Kaluts, a stunning formation of desert stones. About 1,5h from Kerman. There are villages like Shahdad or smaller desert villages on the way. Higly recommended, specially for sunset! In summer, destertcamping is also possible. This page was last edited on 26 November 2018, at 17:25.